Keith Lloyd, Bob Fox, Ron 'Topsy' Turner , Dave Davies. Bob Thomas, Keith Lloyd, Brian Parrot. Funny place to take a picture! 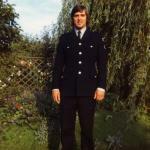 'Dicker' Immins, Portsmouth Ambulance Service 1973.